"Whaddyamean Fasting? It's The Holidays!" Keep Christ in Christmas … by Removing Gifts? Christmas parties, good ole’ St. Nick, & shop, shop, shop! Our Christmas list is prepared well in advance and -look out! – lights and trees up in November! These are a few things that begin to consume many of our minds as the holiday season approaches. We can’t wait until Christmas and the array of fashionable clothes, iPhones, and decisions, decisions! LCD or Plasma? Mac or Windows? And who knows what else! It’s a time to eat, drink and be merry, right? But wait a minute. Did I hear someone say that we are supposed to be fasting??? 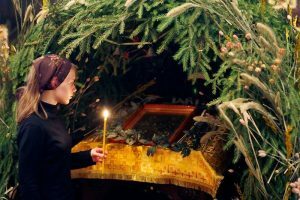 For us Orthodox Christians, November 15 marks the beginning of a 40-day fast that concludes on the Feast of our Lord’s Nativity (a.k.a., Christmas). 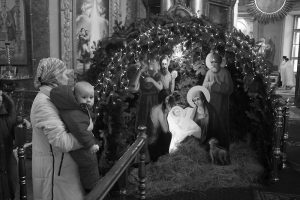 The Nativity Fast is a time of preparation for the birth of our Lord. We are taught to fast from meat, dairy products and fish. Let’s be honest. Many of us go to schools and live in homes where we do not observe any sort of fast during this time, and for those of us who do, it’s pretty difficult to say the least! How can we possibly go to a Christmas party and not eat meat or cheese or drink eggnog? Why would someone choose to fast during this time when it seems like everyone else is doing the opposite? In reality, the answer is pretty simple: Jesus Christ. 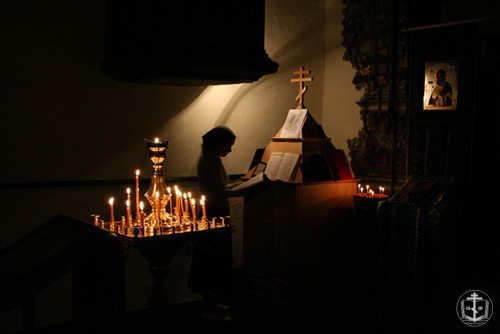 We are taught to fast during this time, not as a punishment or because the Church doesn’t want us to have fun, but because the Church is concerned with one thing and one thing only, our salvation. Think about it. The world we live in today teaches us to continually seek to do one thing – love ourselves. Jesus Christ, through the Church, teaches us to continually seek to do another thing – love our neighbor. Society teaches us to order the best-tasting, most expensive steak. Christ teaches us to forget about the steak, eat a plate of spaghetti or some lentil soup, and use the money to buy a meal for someone who hasn’t eaten in days. Society teaches us to spend time and money on Christmas trees, Christmas lights, and expensive gifts. Christ teaches us to be a tree that bears fruit, to be a light in the darkness, and to put on the gifts of the Holy Spirit: love, joy, peace, longsuffering, kindness, goodness, faithfulness, gentleness and self-control (Gal 5.22-23). There are no easy answers to the situations we may face this holiday season if we choose to follow the narrow way of the Gospel. One thing that must be said is that we cannot do it alone. We need each other! Our friends, families and our churches should be fasting together as best we can. We also need prayer. Fasting is of no value unless we pray also. Encourage your family and friends to pray together at meals and even ask your priest if he will have extra services during the fasting period. Perhaps most importantly, talk with your priest or spiritual father about how to approach the Fast. He will be your guide and source of wisdom to help during this time. Each day is an opportunity for us to choose to live as a Christian and accept the responsibility that goes along with it. Rather than just spending hours at the mall looking for the perfect gift, we could spend a couple of hours serving at a soup kitchen and a few dollars on clothes for people who cannot afford to clothe themselves. What a wonderful project this would be for your OCF group this fasting season. We are all quite capable of fasting beginning November 15. As stated above, talk to your priest about how to start, especially if you’ve never done it before. Approach the days ahead not as the “holiday season”, but as preparation for a “Holy Day”, the day of the birth our Lord. May Christ strengthen and guide you in the upcoming months!